Whether you're cruising the Caribbean or hiking in Europe, there's a good chance that you'll pack too much for your vacation. We lug all that extra stuff around with us only to find that we didn't even wear much of it. In these days of baggage fees, packing too much will likely cost you money too. There are ways to pare down your packing list and still look good on your travels. Choose basic wardrobe pieces that are all one color. Let's say beige. It's neutral and can be dressed up with a few bright accessories to provide a variety of outfits. In the neutral of your choice, bring two pairs of trousers, a pair of shorts, a skirt and a tee. Add to that a cardigan in a different color, a couple of scarves and some bright jewelry. A couple of additional colored tops and you'll have tons of variety. If you will need a jacket for your trip, choose the lightest weight design that will do the job. When selecting shoes, bring one good pair for walking and a comfortable pair that's a bit dressier. Resist the temptation to bring more. Shoes are heavy and bulky and are one of the most commonly overpacked items that never leave the suitcase. Select the clothes you bring on vacation based on what you plan to do on your trip. If you have an evening event that requires dressy attire, select something that is light and easily accessorized. Think simple and elegant which most often translates to easy to pack. Though you don't want to bring too much clothing, be sure that you bring appropriate footwear. When you're touring you will probably walk more than you usually do. Don't let blisters and sore feet ruin your vacation. Make room for a pair of gel insoles and some bandages, just in case. With the huge number of performance fabrics out there, there is no reason to pack clothing that needs ironing. Choose pieces that are identified as wrinkle free or wrinkle resistant. When you're packing your clothing, roll the items rather than fold them. They will come out of the bag looking better and will take up less space when packed. Select the bag you want to take and then select your wardrobe accordingly. If you lay out all the clothing you think you want to take and then choose your suitcase, you're probably going to take far too much with you. 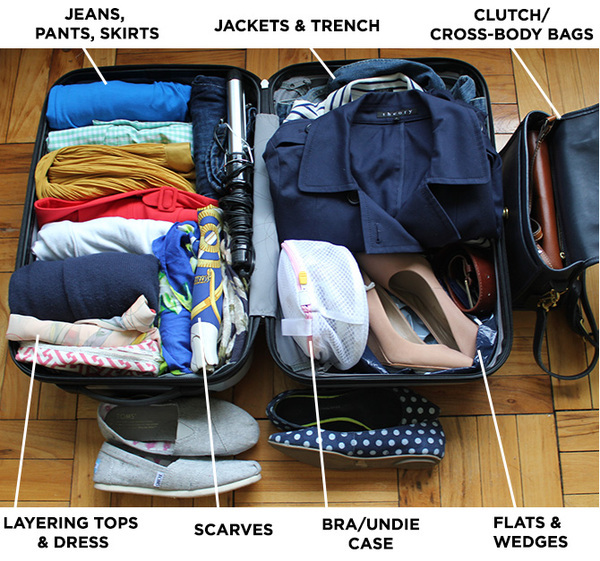 With thought and planning you can pack for a week in a small carry-on bag. If the volume of your clothing isn't going to make it into the bag, consider using a compression bag. These are essentially zip lock plastic bags for larger items. When you've put your items inside, you attach a vacuum nozzle to a vent in the bag and remove all the extra air. The items within are compressed to a fraction of their usual volume. Note, however, that depending on where you're headed on vacation, finding a vacuum cleaner to re-compress for the trip home might not be so easy. If you want to reduce your packing even further, plan to wash your clothing while travelling. Many hotels have laundry facilities or service, or you can visit a commercial laundry. Consider rinsing some items in the sink with a little detergent as well, just be sure to rinse the items well and that you have time for them to line dry. No matter how well one packs, shopping means that you'll be bringing home more than you took. Pack a collapsible fabric tote in your suitcase to handle the overflow on the way home. When you make your purchases, bear in mind that you have to carry it home. Try to select small gifts that are durable and easily transportable. If your vacation destination is in the United States, you may consider mailing some of your purchases home rather than carrying them. Postage is pricey, but not so bad when weighted against the hassle of handling an extra bag and the possibility that the airline will charge you for it if you are flying. Struggling with luggage is no fun. Keep it to a minimum and have a great time on your next vacation.